The Weirdest Story of the College Football Offseason: South Carolina continues to blow my mind. Jadeveon Clowney said last week at SEC Media Days that he stays out of trouble by staying out of bars and off of Twitter. To be clear: I’m not alleging anything at all regarding Clowney and Beyonce’s husband. Collegiate players are allowed to talk with agents. They just can’t sign with agents or receive any benefits from agents. So Clowney was not admitting any wrongdoing. But, he was kind of opening himself up for some digging. Let’s put it this way: if I had a no-compete clause at my real-world job that said I couldn’t sign a contract with any other financial firm, I probably wouldn’t Tweet about having dinner with a competitor. Is having dinner with a rival firm illegal per my contract? No. But why would I subject myself to that extra degree of suspicion and investigation. 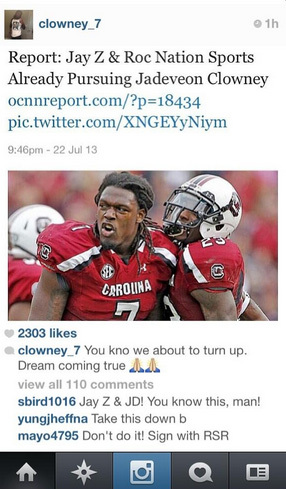 Clowney might not have been that smart (that’s probably why he deleted the post so quickly), but he didn’t do anything that violates an NCAA rule…at least not according to Instagram. But of course, South Carolina then had the obligation to dig around and make sure everything was in order. 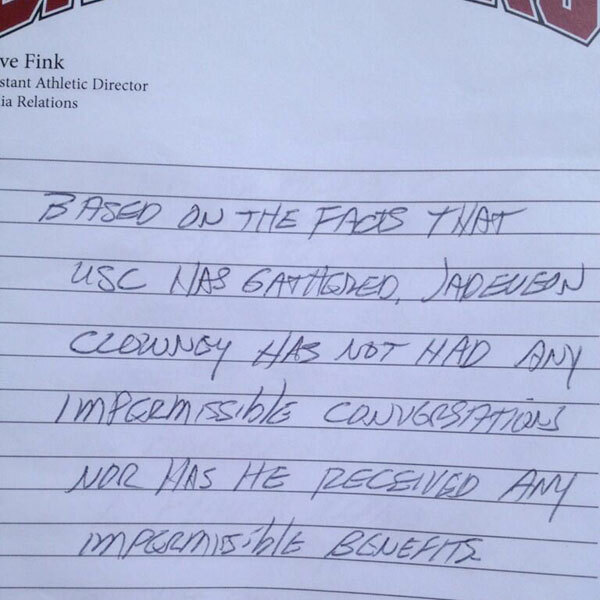 Based on the facts that USC has gathered, Jadeveon Clowney has not had any impermissible conversations nor has he received any impermissible benefits. That’s good news for just about everyone including, but not limited to: Jadeveon, South Carolina Football, Jay Z, the NCAA, Defense, etc. It’s bad news for opposing players and concussions. For me: it’s very bizarre news. Because the statement South Carolina Assistant AD Steve Fink released was hand-written. Who does that? South Carolina blows my mind. This press release is the single weirdest thing that has happened all offseason.